The Museum für Naturkunde in Berlin has the tallest mounted dinosaur skeleton in the world, a primeval bird fossil and polar bear Knut as top attractions in addition to many fascinating displays. As part of the Humboldt University, many of the items in the Museum of Natural History are for studying purposes and thus a delightful policy of staking them deep and piling them high is followed in many displays. Apart from the popular dinosaur hall, the museum is also particularly famous for its fine taxidermy, fossils, and a large collection of specimens preserved in alcohol. Further permanent displays include minerals, the cosmos and solar system, evolution in action, and an exploration station. Naturkundemuseum was never going to be a sufficient name for the largest museum of natural history in Germany and one of the most important in the world. Officially, it is the Museum für Naturkunde – Leibniz-Institut für Evolutions- und Biodiversitätsforschung an der Humboldt-Universität zu Berlin. This link to the Humboldt University and Leibnitz Institute partly explains the vastness of its collection of over 30 million items. Only around 9,000 items are used in the ten halls with permanent displays and specialized temporary exhibitions. 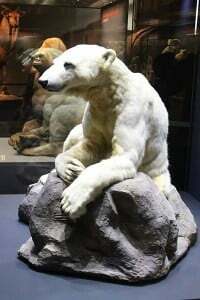 The dinosaurs, fossils and Knut the stuffed polar bear are probably the most popular items with visitors but scientists are more impressed by the size and comprehensiveness of the less glamorous collections. The zoological collection alone consists of 25 million items including 9 million specimens in the mollusk collection alone. The mineral collection covers 75% of the minerals in the world. Dinosaurs are popular attractions at most natural history museums and the Museum für Natrukunde in Berlin is no exception. Visitors are generally guided first into the dinosaur hall (Saurierwelt) with its stunning skeletons and fossils. 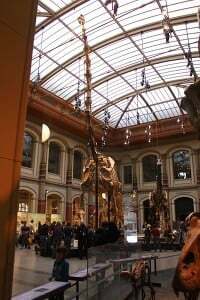 The tallest mounted dinosaur skeleton in the world is in the Natural History Museum in Berlin. The well-preserved skull of the of the plant-eating Brachiosaurus brancai towers 13.27 m above the Guinness Book of World Records certificate confirming that it is the tallest in the world. Some of the more interesting interactive displays here allow visitors to look at various dinosaur skeletons and then see them virtually putting back, or loosing, the rest of their bodies and skin. The museum also displays a large number of fossils including one of the most famous fossils in the world – the Berlin specimen of the primeval bird Archaeopteryx lithographica. This fossil, which shows characteristics of both birds and lizards, helped to confirm Darwin’s theory that when new species develop, transitional forms would develop showing the characteristics of the old and new species. The Museum für Naturkunde in Berlin is world famous for its taxidermy, models and animal specimens. These items are used in a variety of displays and exhibitions in the museum. The two most famous stuffed animals in the museum are currently in the Masterpieces of Taxidermy hall, where the processes and different techniques used to stuff animals are explained. Currently, the more famous is Knut, a polar bear born in captivity in Berlin Zoo in 2006. He received enormous attention and affection from the German public when raised by zookeepers after his mother had rejected him at birth. In later years, Knut was said to suffer from attention deficit disorder. He died aged four (30 would be more normal) from drowning while suffering from encephalitis. Historically, of more importance was Bobby the Gorilla that died in Berlin in 1936. He was the first gorilla in Germany to develop from a child to an adult, although his underdeveloped pituitary gland prevented him from maturing physically. New techniques were successfully developed to preserve his sparsely-haired body parts. With so many stuffed animals available, the museum fortunately stack them high in other exhibition areas so visitors can see a large variety of animals and at the same time observe the mechanisms of evolution. The museum has a copy from 1785 of a quagga (extinct since 1883) but the dodo is a reconstruction. The museum also has a massive wet collection: 1 million animals preserved in 276,000 glass bottles using 80 t of alcohol. The system earth exhibition explains how the earth is changing, particularly due to volcanic activity, earthquakes, and meteoric falls. The museum has nearly 5,000 fragments from 2,300 different meteorites. The section on the cosmos and solar system is fairly small. A special cinema, where visitors almost lie flat on their backs with the with a screen being lowered as time passes by, does a popular explanation of the big bang and the origins of the solar system. 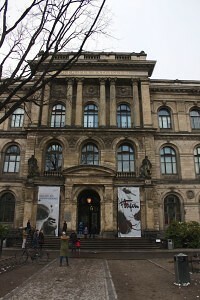 The Berlin natural history museum is also famous for its huge minerals collection. Its 250,000 minerals specimens cover 75% of all known minerals in the world while it has a further 57,000 petrographic-geographic samples. Around 1,000 items are on display including the largest single piece of amber in the world and the pitchblende in which Uranium was first discovered (1789). The natural history museum offers a refreshing alternative to the endless history and art museums that Berlin is justifiably famous for. It is a great museum for families with items of interest to children of all ages. The museum has the normal range of interactive displays, touchscreens, and buttons that may be pushed. 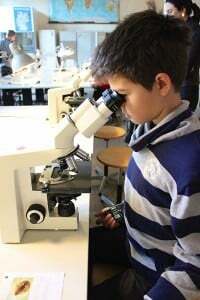 More scientifically is the change to glance through Carl Zeiss microscopes – usually set up Wednesday from 1 to 3 pm. The museum is large but not excessively big. It is possible to enjoy the highlights in an hour but it is easy to spend two hours to half a day here without studying more than just a fraction of the displays in detail. The layout of the museum makes it easy to focus on themes of interest and just glance at a few further highlights while walking through the various halls. Most of the items, especially newer displays and museum highlights, are fully described in both German and English. 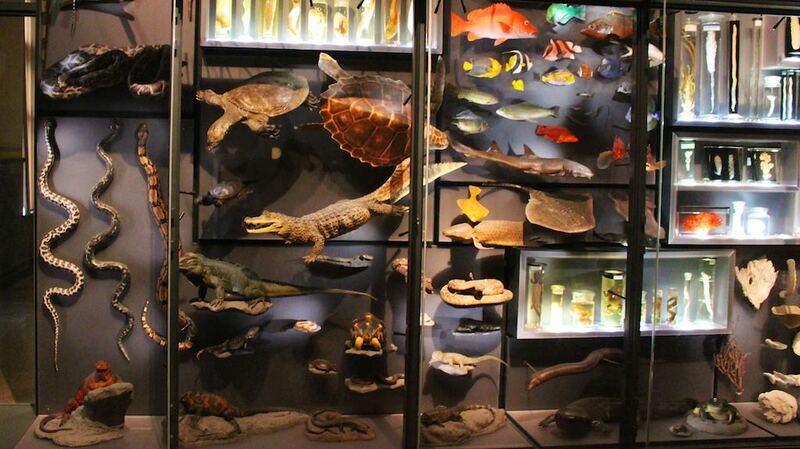 The Naturkundemuseum is open Tuesday to Friday from 9:30 am to 6 pm and weekends from 10 am to 6 pm. The museum is open on some Mondays during Berlin school vacations. Admission to the museum is €6 for adults and €3.50 for school children older than 6. Family ticket prices encourage parents to bring their children: the Mini-Famlienkarte is €6.50 for one adult and up to two children younger than 14 while the full Familienkarte is valid for two adults and up to three children. Berlin Welcome Card discounts are given. The Museum für Naturkunde is located at Invalidenstraße 43 to the north of Berlin’s center. It is very easily reached on public transportation and within easy walking distance from amongst other the Hauptbahnhof, Hamburger Bahnhof Contemporary Art Museum and the Nordbahnhof near the Bernauer Straße Berlin Wall memorial. U-Bahn station Naturkundemuseum (line 6) is around the corner from the museum offering easy transportation from Berlin-Mitte, e.g. Friedrichstraße, Französischer Str., Stadtmitte and Kochstraße stations.